Otis Raybon, Jr. came to the Rome News-Tribune in 1998 as VP Operations, News Publishing Company, the Rome News-Tribune’s parent company. 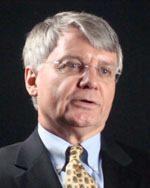 In 2008, Raybon was named publisher of the News-Tribune along with responsibility for six weekly newspapers in NW Georgia and Alabama – including direct mail, magazine coupon booklets, and senior citizen publications. Previously, he was publisher of the Dalton Daily Citizen News, the Griffin Daily News and the Americus Times Recorder. Raybon has served on the board of the Georgia Press Association. He has a degree in marketing from Georgia State University. Otis Raybon, Jr., publisher, The Rome News-Tribune, Rome, Ga., says The Rome News-Tribune traces its history to the Cousa River Journal, founded 167 years ago. Among its alumni is Henry Grady, the famous journalist who later edited the Atlanta Constitution. The Rome News- Tribune has been locally owned, by the Mooney family, since 1928. “There is a passion for the community we are fortunate to serve,” says Raybon.